For the most part, free-standing coat racks are a thing of the past. They belong to a time when closets were only deep enough to hold a couple of suits or a few dresses. As the American home began to include closets of ever-increasing size, the coat rack went the way of the lunchtime martini. Of course, it’s still possible to buy a new coat rack, but modern versions can be a bit bland. Hunting thrift stores and antique shops, however, you will find no shortage of architecturally interesting coat racks, often with attractive patinas. It’s an all-too-common dance: the pot-and-pan shuffle. Limited cabinet space often prompts people to nest smaller cookware items within larger ones, making it more difficult to retrieve what you need later on. 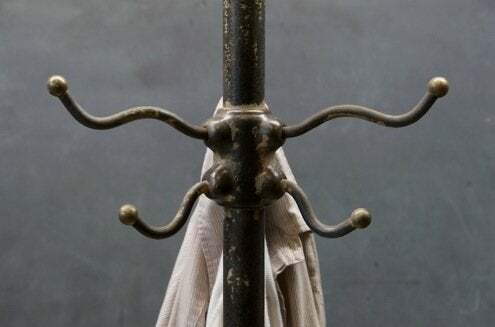 A good, sturdy cast-iron coat rack eliminates this difficulty, because you can hang your most frequently used skillets, woks, and steamers from the rack’s multiple arms. S-hooks facilitate hanging, and rubberized coating (like this from The Home Depot) protects both your coat rack and your kitchen equipment. When your child has his heart set on playing with that one action figure, it’s always lost in the toy chest beneath a landslide of LEGOs, Hot Wheels, and Tonka trucks. Meanwhile, the closet floor is a colorful quicksand: Things disappear down there, never to be seen again. Here’s an idea: Keep your kids’ necessities neatly organized and easily accessible within heavy-duty mesh bags hung from the arms of a coat rack. Use bags of different colors to create a whimsical look or to establish a color-coded organizational scheme. 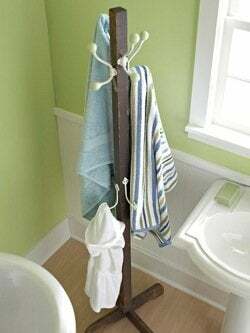 Instead of installing towel hooks or bars in the bathroom, simply stand a coat rack in the corner. Use one side for towels, the other for robes, and presto—you’ve engineered a distinctive alternative to wall storage. Because the coat rack will come into contact with moisture, consider painting or sealing the surface with a clear or colored enamel spray paint. For this purpose, try LeakSeal from Rust-Oleum. It produces a water-resistant rubberized coating that not only protects your coat rack from damage, but can also keep your towels from slipping. After putting a coat rack in the bedroom, you might wonder how you ever managed to live without one. This is a great way to keep your comfy around-the-house clothes off the floor and close at hand. Perhaps the most visually appealing items to hang are men’s ties and women’s scarves. A coat rack lets you enjoy (and show off) these accessories’ rich patterns, colors, and textures, even as they’re tidily stored and kept wrinkle-free. If properly sealed, a wooden or metal coat rack can be placed out in the garden, where a new world of possibilities opens up for it. Hang birdhouses from the rack’s various arms to create a mini condo development for your winged friends. Or string a series of solar lights for a unique outdoor floor lamp sure to make your visitors light up.